Are there any fishing camps for boys (co-ed) age 8? Absolutely! 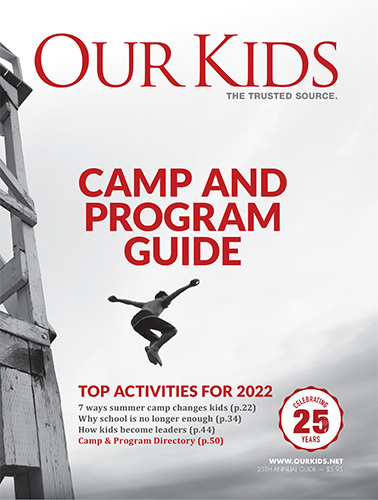 We have information on our website devoted to fishing camps listed here: http://www.ourkids.net/fishing-camps.php, including information on the the type of camp and location in the right hand column, as well as additional information you may find useful. In addition, you may like to use our Advanced Search feature that allows you search for camps in your area based on criteria that's most important to you, including age range, programs and fees: http://www.ourkids.net/school/school-search.php Attending the upcoming Camp Expo on February 23rd, 2014 is also an excellent opportunity to speak with many different types of camps face to face: http://www.ourkids.net/campexpo/ - many families find this a valuable resource to helping narrow down their camp choices and answering their questions. How old does a child have to be to attend a camp? How long, or short, a camp session should my child attend the first time? My child wants to bring a GameBoy and iPod to camp. Is that okay? Can I drop by for a visit while my child is at camp? My child has special needs. Is there a camp for her? Please specify how is it arranged for international campers the travelling process,including transits in airports. I have a daghter 9 years old, living in Albania/Europe and intrested for a residential camp. She does not speak neither English nor French, only some words in English. Your information will help me for a final decision. Regards, Arben Zenelaj. My 9 year old son is an advanced tennis player. We are from Mexico and during the summer we intend to visit Toronto for 3 weeks. Would it be possible to enrol him in a camp or tennis school for exclusively tennis week practices ( 3 or 4 hours during the morning) in order for him to learn from your experience? My daughter will be attending an ice-skating course in Markham therefore we are looking for nearby tennis courses. WOULD LIKE FOR BOTH KIDS (AGE 5 AND 7) TO BE IN THE SAME FACILITY IF POSSIBLE.